I'm stuck awake right now in the wee hours. my knee has gone out. I used to be able to get it back. But today, not so lucky. Still trying with heat and prescription strength aleve. So as I sit here, I'm reading my last thread and read how offended SD seems to be. He seems to be preaching that intolerance lives here and kind of laid it at my feet for that matter. So I went back through SD's religious postings. Personally, I don't think I ever mocked him or belittled him. I think I just stated my point of view. Like, hey, I didn't really get into that Tracy Adkings song, or that 5 extra months of life or whatever it was seemed pretty inconsequential, especially if you're really sick during those months. After reading through many of the posts I see some mocking going on. I don't feel I am. But some. But not all. Some are just saying what they think. Some have questions and how that works and so on. Some have challenges. But it's not like the entire group is ganging up on anyone with a religious POV. Maybe SD got the impression somehow that this was a religion friendly place? Maybe he thought it would be safe to be here and be conservative and feels bashed here? He seemed to feel the previous conservatives were chased away by intolerance. Maybe some. But I think most found richer, greener pastures to haunt in those other media venues. Where they can shout louder with loud friends at their enemy. It's kind of lonely to do it alone. Besldes actual discussion is great. When the person crying about intolerance refuses to engage, he's left with only one impression because we never even reach the arc in the conversation. And then therre's intlerance and mocking coming from that side also, so , it's hardley a one way street. My passion for fiery politics has waned as my health has worsened. That’s not a bad thing. I’m more interested in policies that affect me staying alive. But religious psychos are still a threat to our society and so I’ll still attempt to stand up to their terrorism. Juniper, sorry to hear about your knee. Handling pain, especially during the night hours, is no fun. I don't believe you have posted anything derogatory towards SD. You are usually pretty tactful and it seems you try to choose your words carefully. The few "in your face" Christians who have been members here have, for the most part, been right wing conservatives. They say things, then when called on it, whine about being picked on. It happens a lot in FB groups as well. The attached meme explains my feelings. Maybe it's just me but what I find somewha offensive are the many times I'm told by the Christians how I like to kill children. 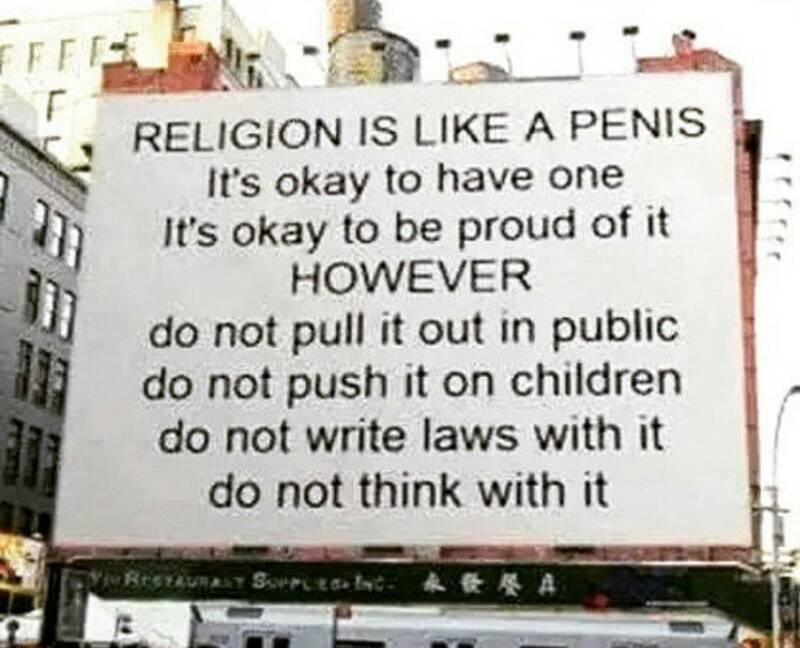 (03-24-2019, 10:35 AM)tvguy Wrote: Maybe it's just me but what I find somewha offensive are the many times I'm told by the Christians how I like to kill children. ...and SD is guilty of this! Telling nonbelievers, "I will pray for you". You know full well that they are only saying it to try to get the nonbeliever's goat. Pray for your damn self... that maybe some day you can be a good person without the threat of Hell hanging over you! Admittedly, I've never heard SD say " I will pray for you" and I have seen him say in a way that conveys selfless, Christian value and sincerity. 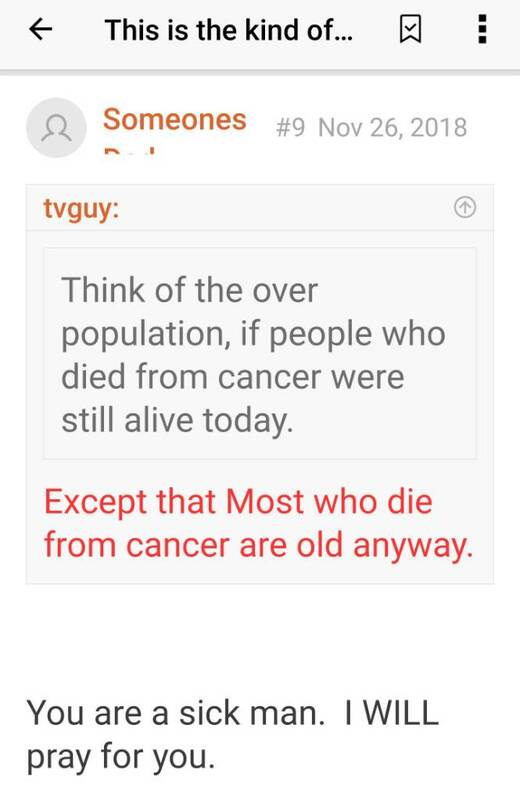 My comment in response to Chuck talking about cancer death slowing over population made perfect sense. When deaths from cancer are the elderly their deaths don't really help as far as overpopulation if they are near the end anyway. I think he did that shortly after arriving here. It's just not important enough to me to go find it. I found it LOL You must not be as bored as I.
TVg beat me to it. It actually only took me less than a a minute. I'm not really bored, I'm just being lazy. After I eat I will go out and start on one of the ten thousands things I need to or should be doing. ^ Ha ha ^ I wrote that entirely WRONG...I put in the word "Never". I shouldn't have. I have seen him saying to Scrapper and TV for sure in a condescending, and patronizing fashion.